Early Wednesday morning, Amarillo police officers were dispatched to the 1500 block of south Ong Street on a fight. The victims, a 27 year old male and a 27 year old female, heard their neighbor’s dog barking and woke up to find two males breaking into the neighbor’s vehicle. As the victims confronted the suspects and one of them fled on foot. 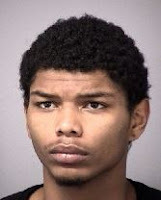 Investigators said the second suspect, 17 year old Sir Alek Jaeron Gonzalez, pulled out a knife, that was stolen during an auto burglary, and threatened the victims. The victims called the police and after a physical altercation, were able to detain Gonzalez until officers arrived. Gonzalez was found in possession of property taken during several auto burglaries in the area. He was placed under arrest for robbery and booked into the Potter County Detention Center. The victims in this case received minor injuries from the altercation. Police officers would never ask or advise anyone to put themselves in harm’s way to detain a suspect, but the Amarillo Police Department would like to commend the victims in this case for their bravery in stopping this suspect and helping to keep their neighborhood and the city safe.